Obedience is hard. For someone to have perfect obedience seems nigh impossible and quite frankly, completely undesirable. Obedience is a sacrifice of our will to another person’s will. Typically people don’t like to sacrifice their will to another, and when they see someone who constantly does they think something must be wrong with them. 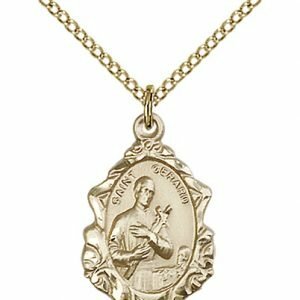 What’s so amazing about St. Gerard is that he had perfect obedience to God’s will. He willingly sacrificed his will to God’s in order to do God’s work. This sacrifice was a great act of faith and love, which Gerard showed all throughout his life. Gerard grew up with three older sisters. His mama, Benedetta, told him ever since he was little how amazing and overwhelming God’s love was. Gerard grew up with a loving heart, confident in God’s love. His dad died when Gerard was only twelve, and Gerard was apprenticed out to a tailor. He eventually became a journeyman tailor, the halfway-there spot in an apprenticeship. Soon after, he set up his own shop, run out of his mama’s house. He ran a good business, and after he had set aside some of the profit for his mama and sisters, he donated the rest to the poor and to donations for prayers for the souls in purgatory. 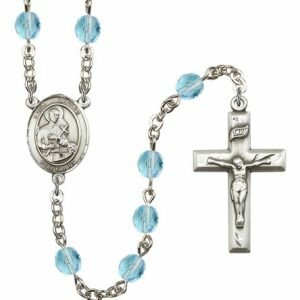 When Gerard was twenty-three, Redemptorist missionaries came to his home town of Muro in Italy. After observing them in their missionary duties, he became convinced that he belonged in their order. Gerard asked if he could join their missionaries and was turned down because of his health. Gerard was not to be deterred from his vocation, and with the ingenuity imbedded in all young minds, tied his bed sheets together and escaped out his window to follow them. The missionaries were twelve miles away from Muro when Gerard caught up with them. Not bad for a guy rejected because of health reasons. 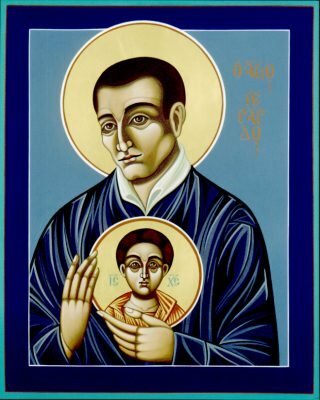 Gerard was reluctantly sent to the Redemptorist community in Deliceto, bearing a letter for the superior that read, in part, “I am sending you another Brother, who will be useless as far as work is concerned…” The Father was mistaken: Gerard was anything but useless. After taking his first vows, he plunged into the lifestyle with abandon. He did the work of three men, and was considered a “miracle of obedience”. True, Gerard was perfectly obedient. He longed for unity with God’s will so much that no matter what His will was, Gerard would do it. Since Gerard saw his superior’s will as God’s will, he did everything and anything they asked him to do. So great was his obedience that they would merely think of something for him to do, and he would do it. 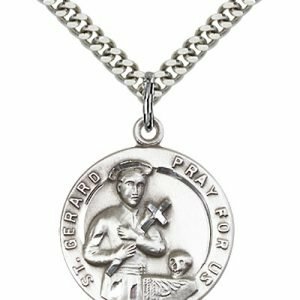 In obedience to God’s will, Gerard went on a lot of mission trips, running retreats, helping young girls join convents, helping the poor, saving souls, and performing miracles. 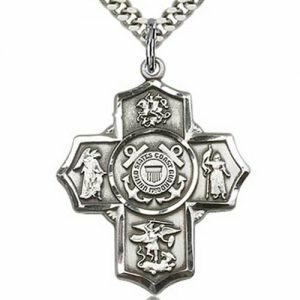 There is a well- known story in St. Gerard’s life concerning one of the girls he helped get into a convent. Her name was Neria Caggiano. Neria found out that she was not cut out to be a nun, and within three weeks of joining the convent she went straight back home. As an explanation for her early departure, Neria slandered the sisters and their lifestyle. The people didn’t buy it. Gerard was already seen as a saint, and he was the one who recommended the convent. So Neria shifted her attack. She sent a letter to St. Alphonsus Ligouri, founder and superior of the Redemptorists. In said letter, she confided that Gerard was not in an appropriate relationship with one of the daughters in the house of a family he stayed with on his mission trips. St. Alphonsus was quite rightly appalled, and called for Gerard to explain. Gerard took a page out of Christ’s book and said not a single word. Without evidence to point either way except the letter, St. Alphonsus gave Gerard a severe penance. He was to have no contact with the outside world, and was forbidden from receiving the Eucharist until further notice. Gerard, believing the affair to be God’s will, submitted humbly. Some time later, Neria fell severely ill. She wrote another letter to Alphonsus, confessing that the letter she had written about Gerard was slanderous and that he was innocent. Alphonsus, probably having suffered more misery over Gerard’s predicament more than Gerard did, was elated to hear of his spiritual son’s innocence. Gerard was content with God’s will being done. Gerard was once again set loose on the world. He performed many miracles of various types while on his missionary travels. He is best known for his miracles helping children and their mothers, especially mothers giving birth. 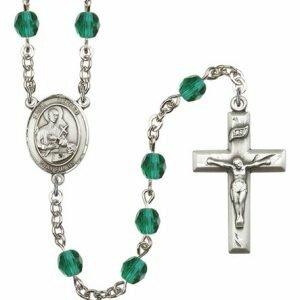 His prayers helped a mother and child survive a difficult childbirth. His handkerchief, which he had left behind years ago at a friend’s house while on the road, helped the daughter of that friend survive her child’s birth. The same daughter had been the one to tell Gerard that he left his handkerchief. He had told her to keep it. With all the miracles that Gerard performed, it was no wonder that the people who knew him called him a saint. I suppose when someone loves so much and is in such union with God’s will, they can’t help but perform miracles. They are a perfect vessel for God to work his miracles through. However, no one can stay on this earth forever, no matter how wonderful they are. In 1755, Gerard was bedridden with hemorrhages and dysentery. The end seemed imminent, but Gerard’s superior ordered him not to die, if God so willed it. Gerard’s afflictions almost immediately vanished, and he spent another month out with the brothers. Soon the borrowed month was up, and Gerard was in bed once more. He had a sign posted on his door that read “The will of God is done here, as God wills it and as long as he wills it.” His loving, obedient soul joined God on October 15, 1755. 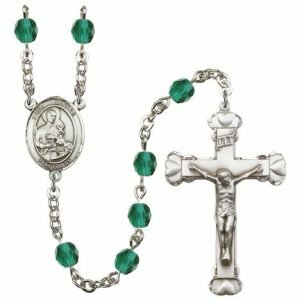 The death of the twenty-nine year old saint struck thousands of people. Many came to see “their saint” who had loved them so much and whom they loved in return. Miracles through Gerard’s intercession began popping up all over Italy. 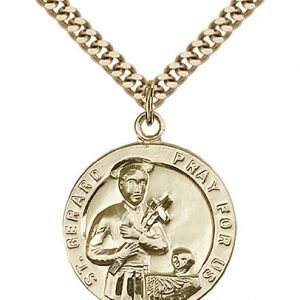 In 1904, the pope made what the people of Italy had always known official, and canonized Gerard as a saint. 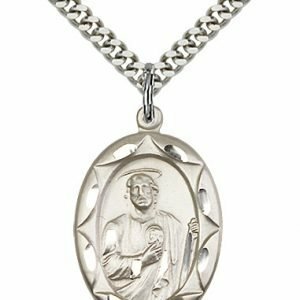 The women of Italy named him the patron saint of mothers, expecting mothers, and children. 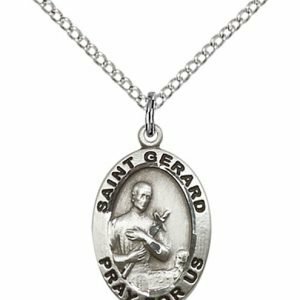 St. Gerard is the patron saint of expectant mothers. 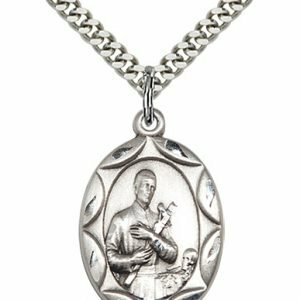 Trying to conceive, and concerns for a healthy baby and mother are among the reason why there is a devotion to St. Gerard. So how does her fit. 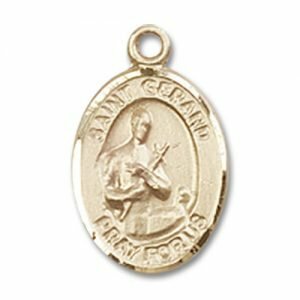 what about St. Gerard and his life is relevant to the issues of pregnancy, childbirth and motherhood. 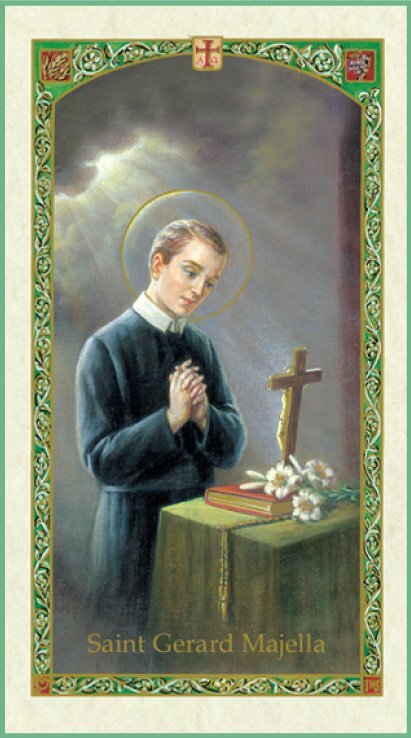 It begins with St. Gerard’s concern during his life. He received this patronage because of his involvement in a miracle that occurred through the placement of his handkerchief on the womb of a woman facing life-threatening complications during childbirth. This handkerchief was used by many other women during difficult labors and deliveries, and has time and time again brought about special graces and miracles. 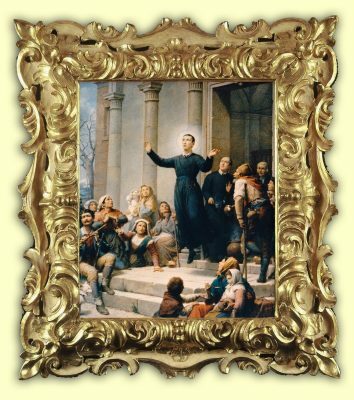 St. Gerard was born in 1726 in Italy. His father died when Gerard was still young leaving the family living in poverty. When he was sent to learn to become a tailor he suffered abuse. Despite his difficult youth he was devout and religious. 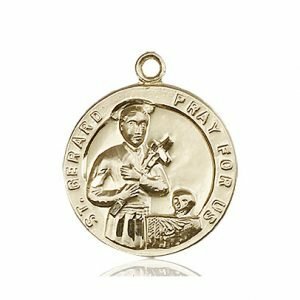 He eventually, after several failed attempts, entered a religious order as a lay brother. Because of his many spiritual gifts, he was a counselor to communities of religious women. He died of tuberculosis at the age of twenty-nine. He was a great example of charity, service, and obedience. 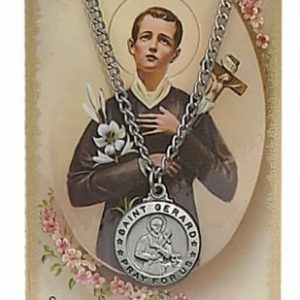 St. Gerard’s feast day is October 16. Gerard cradling a crucifix in his arms – This represents his embrace of the cross of suffering to be more like Jesus. Lilies on a table or altar – A symbol of purity, they refer to a story told of when he was a younger man he would spent the last of the money he had to buy flowers for the altar trusting that God in his providence would provide for his other needs. 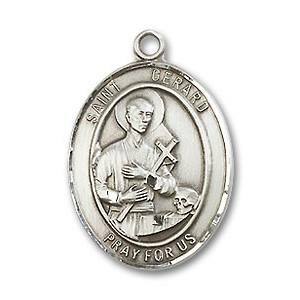 A skull – In many images of the saints as in images of St. Gerard, the skull represents awareness of his mortality and the brevity of life. 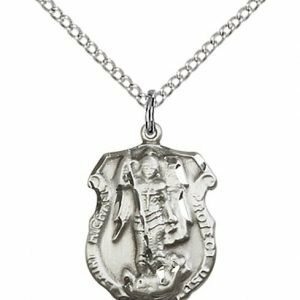 , you did bear, like your Divine Master, without murmur or complaint, the calumnies of wicked men, you have been raised up by God as the patron and protector of expectant mothers. 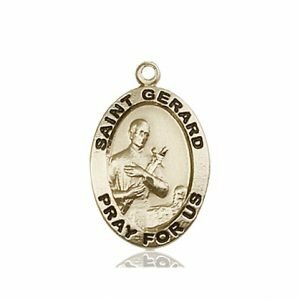 O God, Who didst bestow on Saint Gerard the power of healing all kinds of infirmities, deign to glorify Thy Servant, who was so merciful toward human misery, by delivering me from my present sickness. Grant also that, being strengthened in body, I may take greater care to avoid sin and overcome my evil passions, the spiritual diseases that drag so many to everlasting death. Through Christ our Lord. ~Amen. O almighty and Everlasting God Who through the operation of the Holy Christ, didst prepare the body and soul of the glorious Virgin Mary to be a worthy dwelling place of Thy divine Son; and, through the operation of the same Holy Ghost, didst sanctify Saint John the Baptist, while still in his mother’s womb; hearken to the prayers of Thy humble servant who implore thee, through the intercession of Saint Gerard, to protect her (me); that it may be cleansed by the saving water of baptism and, after a Christian life on earth, it may with its mother, attain everlasting bliss in Heaven. ~Amen.